While LED is very popular because of its low energy consumption combined with its longevity it also has one major drawback. This drawback is the fact that deep red and green colors cannot be very well displayed on a flat panel. To solve this problem the Californian company Nanosys has developed a Quantum Dot Emitting Film (QDEF) that will allow many more colors on those kinds of displays. The traditional light source for a flat panel monitor is an array of blue LED’s. In order to achieve a white light the diodes are covered with phosphor, which results in the diode emitting white light. The problem is that the green and red colors are not well represented and therefore the displays have problems displaying these colors. 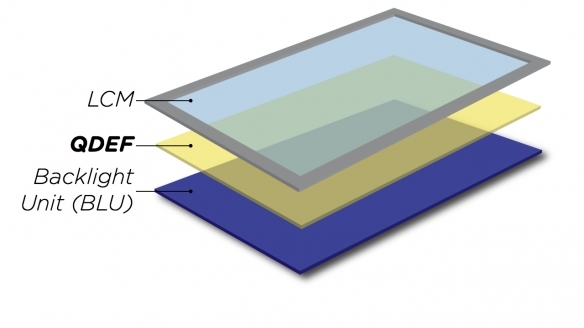 To solve this problem Nanosys has developed a thinfilm that consists of nanocrystals. Every time a nanoctyrsal is bombarded with a blue photon from an LED it will emit another photon that is either red, green or blue. The resulting photon is what the eye sees and, according to the company, will allow for much better colors on flat panel displays. The technology is almost ready for prime time. We should expect to see the first computer displays by first half of next year followed by television monitors in the latter part of the year.